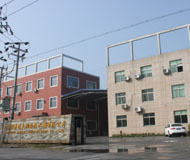 About Us-Haining Sunray Solar Energy Co., Ltd.
Haining Sunray Solar Energy Co., Ltd. is specialized in the application technology of the solar energy . We are also an industrialization company of manufacture and distribution. Our main products are Solar Water Heaters, Solar Energy Projects ,Solar Collectors , Solar pool ionizer, Solar Vacuum Tubes , Solar Accessories,Controller Systems which are highly recommendable for environmental protection. All products are popular with customers all over the country. We are an ISO9001 certified company, and we acquired the CCC certificate and got the second prize on CE. Small order and OEM order accepted. We can guarantee high product quality. According to different individual requirements such as area, climate and consumption level, more and more productions come into the market from Sunray. All our successes are based on the research and analysis of the market. It is undoubted that we will develop more and more new products with our advanced technology, perfect operating system and capable top management. In the recent years, we have opened the market on the world step by step. Our productions and technology all have been recognized by foreign countries, such as American, Europe, Middle East and Southeast Asia. Our high quality products, reasonable prices and comprehensive after-sale services provide our customer with satisfaction in our company. If you are interested in any of our products, please feel free to visit and contact us. We will have a promising future.